It kills me how people go in and mutilate a perfectly good recipe. Then you have bad reviews and more mutilations. 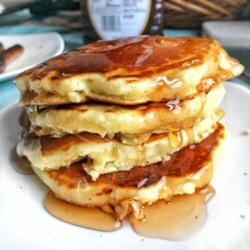 I read these reviews and decided I'd make the recipe just as it calls and I recommend not changing a thing (except maybe adding 1/2 tsp of vanilla to your egg mixture). I DO recommend sifting the flour, twice. That makes for a fluffier pancake. Let your egg and milk set at room tempurature and use unsalted butter. Beat your egg, add the melted butter and beat lightly until blended, then lightly beat in your milk (careful not to overbeat your egg). Add to your dry mixture. Your result is a fluffy, delicious, good old fashion pancake. This is one is a keeper!